How you enter cheat codes with the Xbox 360 controller varies depending on the game you're playing. For example, some cheat codes require you to press specific buttons in a prescribed order at a certain time. In other cases, such as with Grand Theft Auto IV cheat codes, special number codes are entered into a virtual cellphone during gameplay. Here's how to get more acquainted with the console's controller and learn how to use cheat codes on Xbox 360 games like Skyrim. Before you can enter cheat codes for any game, you'll need to know the names of the buttons on the Xbox controller to identify which buttons to press. In many cases, cheat codes use abbreviations for the buttons on the controller. Knowing the names and abbreviations ​of these buttons makes cheating much easier. Abbreviations are often used to describe cheat codes; for example, press "LB" is shorthand for press the "left bumper," or number 3 in the image below. Back: The back button. For some cheats, press the back button before inputting codes. Start: The start button. Some cheats require that you press the start button before inputting codes. Left Thumbstick or Left Analog: The left side thumbstick is also referred to as the left analog or left stick (Ls). Move the left thumbstick in any direction, or press it to use it as a button. Sometimes, cheat codes refer to the left analog button as L3. D-Pad: The directional pad. This is the most common directional input method to enter cheat codes. Right Thumbstick or Right Analog: The right thumbstick is also referred to as the right analog or right stick (Rs) in cheats. Like its left counterpart, it can be used as a button, and some cheat codes refer to the right analog button as R3. A, X, Y, and B: These buttons are labeled on the controller. For many cheat codes, these buttons are used as the main inputs in combination with the D-Pad. Bookmark Xbox Gaming Tips and Strategies to keep up with the latest Xbox 360 cheats, news, and reviews. Often, Xbox 360 cheat guides refer to buttons by the actions they perform in the game. For example, A is the jump button in many games, so a cheat code may simply say "press the jump button." When playing Xbox games on the Xbox 360, the black and white buttons are replaced with the right and left bumpers, so the left bumper replaces the white button, while the right bumper (number 4 in the image) replaces the black button. Cheats have been around since the early days of gaming, but modern games have moved away from cheat codes that rely on button inputs. 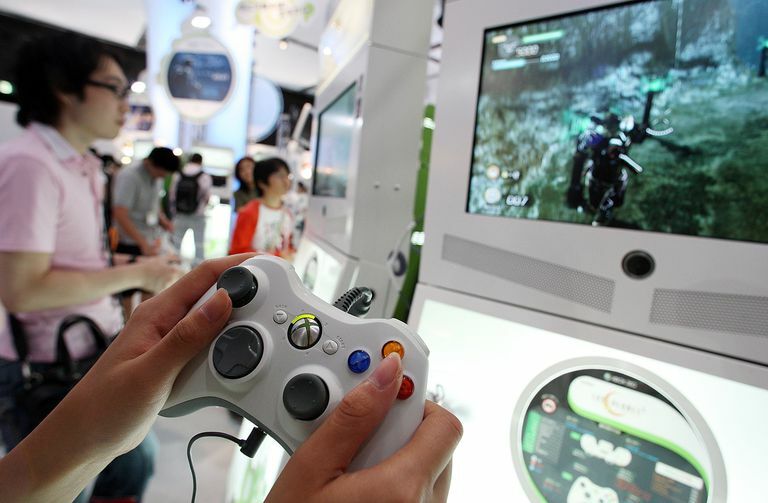 Nonetheless, some players have found a creative way to exploit the Xbox 360 controller to cheat. Go to the game settings and lower the difficulty to Novice. Find a place where no enemies can attack you. Assign the Healing spell, which restores 10 HP per second, to any button. Assign the Equilibrium spell, which drains 25 HP and restores 25 MP per second. Cast Equilibrium by pressing the assigned button. Dual-cast Heal by pressing both assigned buttons simultaneously. Wrap a rubber band or two around the controller to hold the buttons down. Leave the game on and go do something else for a few hours. As you automatically drain and restore HP, your restoration stat keeps leveling up to 100. In Skyrim, use the rubber band trick with the Xbox 360 controller to level up other stats.